Ralf Winkler, the German artist who rose to fame in the 1970s with his caterwauling, violent, humorous, rigorously flat paintings of stick figures, animals and monsters that he signed with the pseudonym A. R. Penck (the better to elude unsympathetic East German officials, at least for a while), has periodically made stuffed felt sculptures. Michael Werner is now showing six of them, and they are thoroughly charming oddities. This is a vital exhibition. 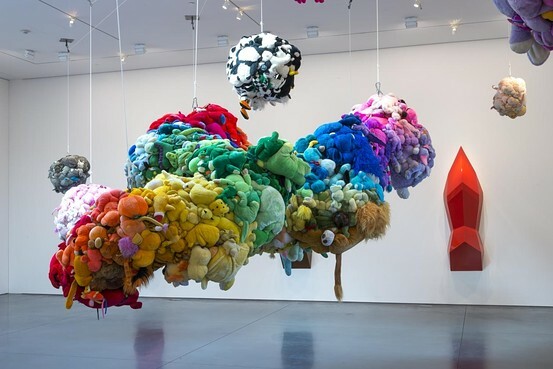 Not only is it the first grouping of these felt works in the U.S. (a larger survey of them at Cologne’s Museum Ludwig in 2012 looks like it was resplendent, judging from photos), it also provides a rare counterpoint to the fabric and stuffed animal sculptures that Mike Kelley began making in the 1980s, which are featured in the late L.A. artist’s current P.S. 1 retrospective, and reveals the considerable debt that Sterling Ruby’s own impressive and creepy recent felt works owe to Mr. Penck. About two-dozen preparatory drawings for felt pieces round things out. It’s a thrill to see an artist who has spent a lifetime mastering the 2-D picture plane sketching out his 3-D works from various angles on paper.